Understanding different political perspectives is necessary now more than ever. “Whitelash,” an independent hip-hop musical, analyzes the politics of the 2016 election and the ways in which America can move forward. The 2016 presidential election is considered to be one of, if not the most, controversial American elections of all time. Contradicting ideologies spurred by the canditures of Hillary Clinton and President Donald Trump further divided America and fueled resentment among people on all sides. With additional drama unfurling around issues such as emails, tax returns, and Russian involvement, the presidential race seemed more like a TV show than a landmark political event. At times, it was hard to believe it was true. John Muir College senior Johnny Echavarria, a music humanities major and campus-wide senator for the arts and humanities, writes and stars in “Whitelash,” a hip-hop musical about the 2016 presidential election. Set on a college campus, “Whitelash” follows nine students of various backgrounds and opinions as they navigate life during one of the most politically charged eras of all time. The characters are personally impacted by what Echavarria calls “the clashing of ideologies present during the election” and struggle to reconcile their politics with their relationships. Each character in “Whitelash” is a case study in different perspectives. There’s a Trump supporter who falls in love with an Iranian refugee, a sorority girl obsessed with her political image on social media, a father disagreeing with his son, a Bernie Sanders supporter, a Hillary Supporter, a DACA recipient, a Black Lives Matter activist, and multiple characters with vacillating opinions. But despite the fact that the musical delves deep into each viewpoint, it doesn’t present one side as inherently better than any other. It instead examines the messy nature of political debate and how politics are ultimately present in every human interaction — especially when it comes to a diverse place like a college campus. Echavarria chose a college campus as the setting not only because it’s relevant to his target audience’s experience (they experienced the election during their college and early voting years), but also because it’s the perfect place to present dissenting opinion and constructive dialogue. Students come from all over the world to attend UC San Diego and they bring their unique perspectives with them. 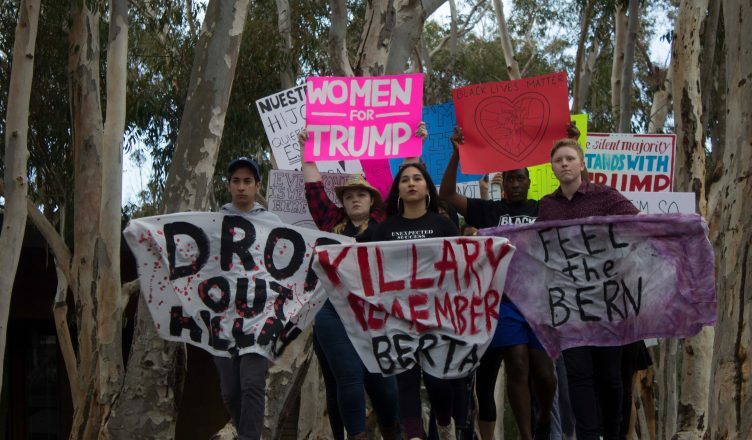 However, the opinions shared on this campus don’t always necessarily come from UCSD students. Anyone is allowed to physically be at UCSD because it is a public school, and non-students frequently take heed of that. Many of them can be found preaching their opinions (often hate-based) to passerby on Library Walk. Echavarria was also exposed to the different politics of different places as a canvassing director in Sanders’ presidential campaign. He took a semester off from school to participate and was deeply influenced by the people he met and the stories he heard. It was because of this interest that he decided to incorporate a experience from the campaign trail into the show. Of course, the mainstream media plays a direct role in determining which stories are told, often ignoring marginalized perspectives. Echavarria makes sure to include unpopular and underrepresented perspectives. He was partially inspired by Paulo Freire’s political theory book “Pedagogy of the Oppressed,” which argues that oppression can be overcome when marginalized groups gain direct involvement in educating others about their struggle. Echavarria applies this teaching model to the stage in “Whitelash” by having characters of various backgrounds explain the reasons for their personal beliefs, he invites the audience to understand and respect their opinions. However, the diverse perspectives written into “Whitelash” raise the question of appropriation in writing: If Echavarria doesn’t know what it’s like to be the daughter of Iranian refugees, is it OK for him to write her story without firsthand knowledge of her experience? Would this be perpetuating stereotypes? Who is allowed to tell whose story? Echavarria was fully aware of his responsibility as a storyteller. Both he and Nicole Lopez, the actress playing the character, conducted extensive research to make sure that the people whose perspectives were being represented were personally involved in the process. This unity and openness to other opinions is the main theme of the show, and the title specifically references this message — although it may seem like otherwise. “Whitelash,” is a term coined by the CNN political commentator Van Jones on the night of the election. Jones described Trump’s election as “a whitelash against a changing country” and as “a whitelash against a black president.” He argued that it was necessary for Trump to apologize to those he had offended and unify the country. In his opinion, everyone needed to come together despite their differences. Even though Echavarria wrote the show almost two years ago, Eleanor Roosevelt College freshman Jolie Andersen, a theater major acting in the musical, believes it is still extremely relevant. The cast and crew of “Whitelash” has been working on the production since Week 0 of this year. “Whitelash” struggled to receive departmental support, and it is a completely student-run, independent show funded by its own cast and produced by the student theater organization Company 157. This show is important — it makes the audience think more than they probably do in the classroom — and demonstrates exactly why the arts matter. Muir College senior Sofia Zaratoga, a theater major and undergraduate representative for the theater department, is directing “Whitelash.” She hopes that viewers can recognize the importance of the 2016 election and understand the significance of living through it. Hopefully, “Whitelash” can inspire important conversations and teach a valuable lesson about unity. reminds me of the Pepsi commercial. The music and lyrics are fantastic. The hip hop songs ought to be played on mainstream radio. This truly amazing play could be taken on the road throughout America and beyond. Absolutely phenomenal.